Winter's candied treasure hidden below the snow, just waiting to be picked and savored. Imagine the scent of sweet berries under winter frost. 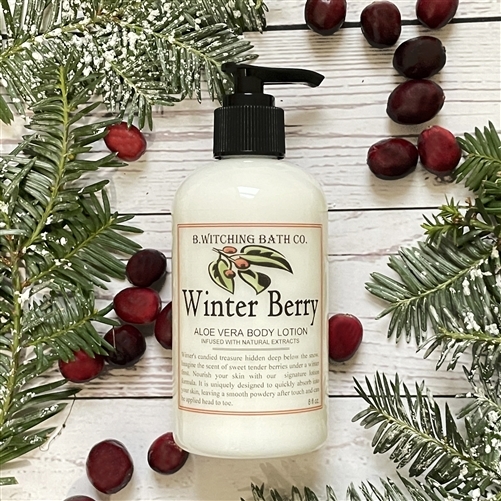 This fragrance combines notes of cranberry, red currant, and sweet blackberry. Our silky smooth lotion formula moisturizes your skin with Aloe Vera harvested from the inner most leaves of the plant and Vitamin E. Infused with the fragrance of fresh botanicals, these heavenly scents will linger on your skin for hours. True decadence! 8 fl. oz. Distilled Spring Water, Isoprpoyl Myristate, Cetearyl Alcohol, Cetearath 20, Caprylic/Capric Glycerides, Dimethicone, Stearyl Alcohol, Soybean Oil, Sunflower Oil, Soya Oil, Hydrolyzed Silk, Aloe Barbadensis, Disodium EDTA, Diazolidinyl Urea, Benzophenone4, Iodopropynyl Butylcarbamate.